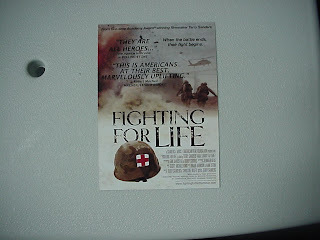 Fighting for Life (2008, Truly Indie / American Film Project, 89 min, not rated but would be R because of the graphic war injuries shown on camera) (link) is a harrowing documentary about the treatment of wounded veterans in Iraq: on the battlefield, in transport, in Germany, and back home at Walter Reed. 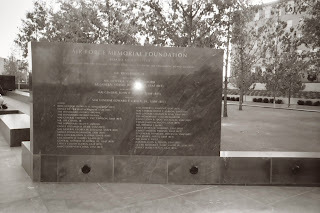 The film covers the experiences of military doctors who go to military medical school at the Uniformed Services University of the Health Sciences "USU" in Bethesda, MD, not far from NIH and the Naval Medical Center, but still a separate campus. The students are already officers, and some may have graduated from service academies. Imagine, then the opportunity to get a four year education at a service academy, followed by four years of medical school, at military expense. I’m not sure how many years of service obligation are entailed. For a hard-working person from a disadvantaged background, it is a dream opportunity. Many of the officers (about half) were women. The next issue, of course, is the horrific nature of the injuries. They are disfiguring, and they are crippling. The movie alternates between classroom scenes and battlefield and military medicine scenes following some specific patients. I recall, shortly after my surgery for my acetabular fracture in Minneapolis in 1998, being in rehab for a week, and one day I watched a patient take his first steps with an artificial limb. That was shocking to see in person, close-up. In the film, there are some scenes like this, with a lot more medical equipment and paraphernalia, even on the transport planes, and open wounds, burns, and amputations are shown close-up and on camera. These are men and women in repeat deployments, originally volunteers but now caught in this “back door draft,” making sacrifices for all of us. Some will have issues of function, and many will have issues of body image, particularly when many of them go back to their marriages, perhaps to be tested. I noticed that some (male) soldiers do not have the same perception of this matter that I would, having covered themselves with tattoos even before joining the military. There are some specific moments in the film. At one point, a female doctor treats an Iraqi man who is horrifically injured and says he wants to die, that he feels ashamed in front of his family. She must comfort him with almost soap opera talk, telling him that he must "fight". In another scene, another female doctor says, that this is a professional job, and that the political issues regarding the merits of the war in Iraq have nothing to do with the job itself. I thought again about the “don’t ask don’t tell” policy. Even if it were to be lifted (and if I could get into a time machine and become 22 years old again), this is simply not the kind of work I could ever deal with myself. I would never have entered combat, rehabilitative or orthopedic or plastic surgery myself as a career. The body image issue would be just too much. It is a special calling for the right person. The movie is important, but agonizing to watch. If you care about justice, then see it.